Straight away I have to admit, I never expected to see the alias ‘Codename John’ appear again! For those of you not familiar with the name, it’s the production alias for the mighty Grooverider. He’s long been dormant, but has made his return with a superhero themed release on Metalheadz, entitled The Avenger EP. I first became aware of Codename John’s lesser known production talents via the seminal Prototype Years album released back in ’97. Which is still my highlight as far as DnB albums, I mean Silver Blade, come on! Back to modern day…as I mentioned, Codename John is back after roughly 10 years of DJing and hosting a regular radio show on Radio 1 with his long time cohort, Fabio. The second track is John & Tony. The standout feature of this track is without doubt the bass-line, it rumbles along and will be sure to be annoying neighbours across the globe when it’s played at home. I have to say that the third track Saviour Selecta, feels a little out of place in amongst the others and didn’t have what I would class as a “Metalheadz” feel. It’s got a jump up aura to it and features a catchy sample but honestly wasn’t my sort of track. Finally, it’s Secret Technique. A track that has a classic Kung Fu sample that had me thinking of some of the older Prototype Recordings tracks by Matrix and Boymerang. It’s got a very nice vibe to the layout and delivery of the track, with the bassline hidden by a very catchy break. I’d be keen to hear others thoughts on the return of the legend that is Codename John. 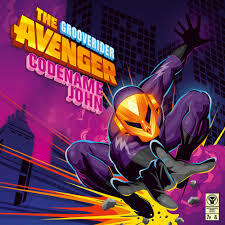 Codename John – The Avenger EP is available HERE.